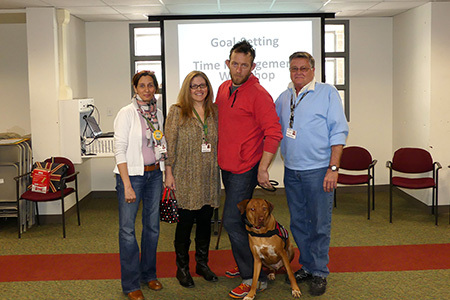 West Windsor, N.J. – The turnout was great and the reaction solidly positive for a “Goal-Setting and Time Management Workshop” hosted by Mercer County Community College’s (MCCC’s) student success coaches in March. Coaches Jennifer Smith, Jehan Mohamed and Tom Kane led a dynamic 60-minute session and, based on student feedback, believe their message was received in the spirit it was intended: to help MCCC students achieve their goals. Starting off the discussion was student Gabriel Matt, who travels around campus with his service dog, Louie, by his side. Matt recalled his own struggles with goal-setting and time management when he first started college, but reassured the assembled students that academic success is possible with the right strategies and tools in hand. According to Success Coach Smith, Matt’s sharing of his own challenges set the tone for a meaningful session, with the coaches leading engaging hands-on activities and sharing practical tools. Student speaker Gabriel Matt, third from left, with Louie by his side, started off the discussion. Matt is pictured with success coaches, from left, Jehan Mohamed, Jennifer Smith and Tom Kane. Smith couldn’t be more pleased. “The feedback we received suggests that students really related to and absorbed the strategies we presented." The workshop concluded with lunch and t-shirts for three winners. “But no student walked away empty-handed. All of them learned how to set realistic goals and to better manage the multiple demands on their time. These lessons will serve them well as college students and in life,” Smith said.